Sept. 18, 2015, 2:36 p.m. 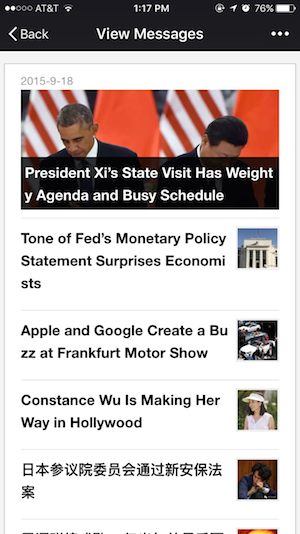 The New York Times is diving into the world of chat apps with a new bilingual WeChat account. The Times will send out a daily digest of news in English and Chinese targeted at WeChat’s millions of users around the world. As chat apps like WeChat, WhatsApp, Line, and Mixt grow in popularity — especially outside the U.S. — publishers have been trying to find ways to crack the code that will bring in new readers. 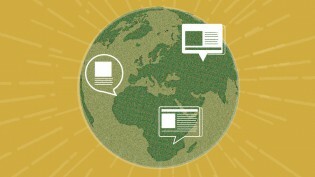 For western news organizations chat apps present an opportunity to report and deliver mobile-first news in places like India, Nigeria, and China. The Times recently tried out WhatsApp to report on Pope Francis’ visit to Latin America. But looking through the paper’s first dispatches on WeChat, they clearly have Chinese readers in mind. Top stories include Chinese President Xi Jinping’s impending visit to the U.S. and meeting with President Obama, as well as a profile of Asian-American actress Constance Wu. Reaching readers in China has been a constant challenge for the Times. 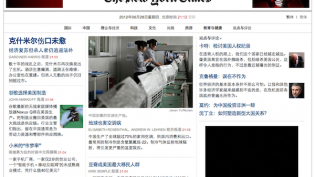 In 2012, the company debuted a Chinese-language site that combined existing stories from nytimes.com with reporting from Times staff based in China. Not long after that, the Times become the latest western news company to find its site blocked by Chinese censors. But the Times has been working to find ways around the censors, using a combination of social media, mirroring, and apps to reach readers. Ellis, Justin. "The New York Times is targeting new readers in Asia through WeChat." Nieman Journalism Lab. Nieman Foundation for Journalism at Harvard, 18 Sep. 2015. Web. 24 Apr. 2019. Ellis, Justin. "The New York Times is targeting new readers in Asia through WeChat." Nieman Journalism Lab. Last modified September 18, 2015. Accessed April 24, 2019. https://www.niemanlab.org/2015/09/the-new-york-times-is-targeting-new-readers-in-asia-through-wechat/.